A recent study done by the Prison Policy Initiative shows that formerly incarcerated people are 10 times more likely to be homeless and some demographics are at an even higher risk; people who have been incarcerated multiple times, people recently released from prison, and people of color and women. A vicious cycle in homelessness all starts with incarceration. Returning citizens often times have difficulty securing a job and housing after they are released due to stigma and systemic barriers. When they try to find shelter in other ways they are often arrested again for public loitering. 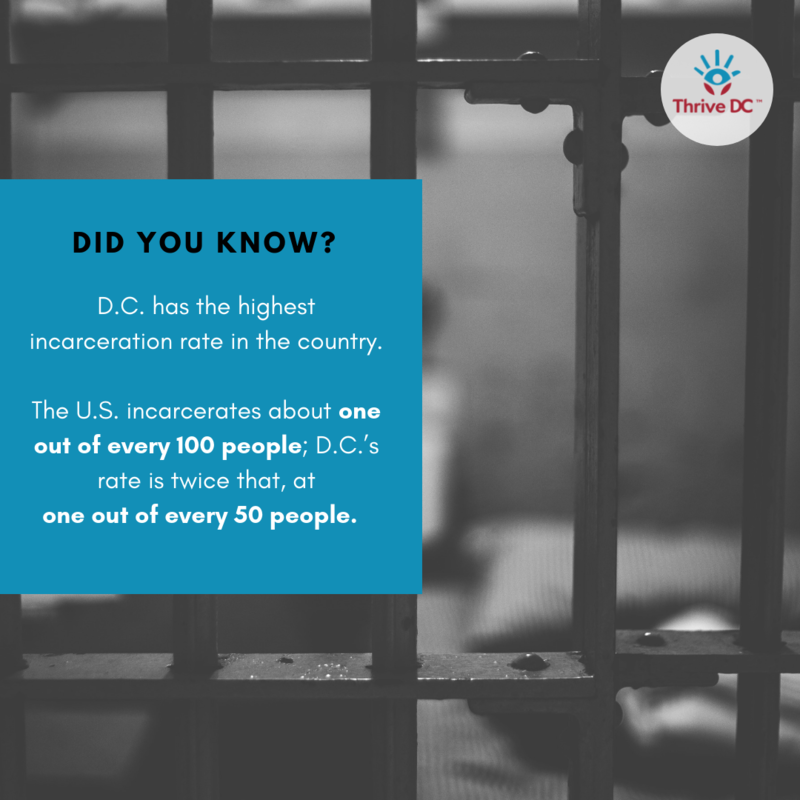 D.C. has the highest incarceration rate in the country, one out of 50 people are incarcerated. Since 2001, the number of women arrested has increased by 19 percent. Releases have increased, but once someone becomes incarcerated their chance of becoming homeless increases as well. States should have systems in place to help released individuals a fair chance at finding housing. Protect individuals from being immediately excluded by their record. Instead, evaluate each applicant as an individual. Stop categorizing homelessness as a crime. Expand social services to assist individuals in becoming successful returning citizens. Here at Thrive DC, we believe re-entry programs are vital to helping individuals get back on their feet—especially women. In a recent study, 45.6% of incarcerated women in D.C. said they had at least a high school education. In another study, 40% of women in prisons had no job prior to being incarcerated. Most who had a job never made above $6.50 an hour. Thrive DC is dedicated to helping individuals overcome this cycle. The New Directions Re-entry Program assists people who are formerly incarcerated get back on track in five key components: Case Management, Basic Needs Assistance, Life Skills Education, Access to Sobriety Maintenance Assistance and Support, and Employment Assistance. Within the Employment Assistance component, clients are able to take part in one of two sub- programs: Customer Service Training and Certification or Real Opportunity Job Training. Both options give clients work experience and knowledge about certain career fields that boost their chances of being hired full time. In addition, clients gain support in their journey to integrating back into their community which is critical to success.